We will close the third edition with this special ceremony based off the concept of 100% responsibility. This Hawaiian system of healing recognized that our external reality is merely a reflection of our internal world. It focuses on “cleaning” the root of our negative thoughts bringing us back into universal alignment. 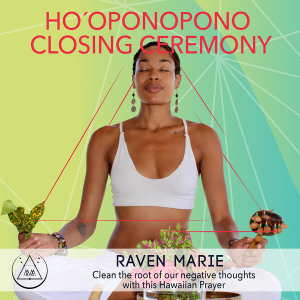 She is a Reiki Master, Ho’oponopono, Holistic Stress Management and Advanced Belief clearing Practitioner. She is also the Regional Wellness Consultant for Selina Costa Rica as well as Host of Vida By Selina. Through energy work, guided visualization as well as uniquely creative workshops that help identify mental and emotional blocks that keeps one stuck, she aims to assist individuals in shifting their mindsets and energetic vibration into a higher state allowing them to tap into their unique power. Using her own life experiences and lessons learned along the way she uses the gift of storytelling to inspire others to live with passion, make their own rules, to take risks, be unafraid to make mistakes and to recognize that pain can be transcended into power and love.